In last April’s protest, over a dozen activists blocked the main traffic artery into the base for over an hour. They were hoping that they could, even temporarily, put a halt to illegal assassination and possibly save some lives. When highway patrol arrived to break up the blockade, five of the protesters proceeded to enter base property to deliver a letter to the base commander, Col. Phil Stewart. The letter charged Col. Stewart, President Barack Obama and all military personnel involved in drone warfare, with crimes against humanity and violations of international and national laws. They are all guilty of denying the right for due process. While each activist was being arrested, she or he handed a copy of the letter to the serviceperson arresting them, requesting that it be delivered to the commander. Before being released, the arrestees were given a “Ban & Bar” letter, signed by Col. Phil Stewart. This letter formally ordered them not to enter or re-enter Beale AFB, and warned of a penalty “fine” of an undisclosed amount and/or maximum imprisonment of 6 months should the order be violated. One of the arrestees, Barry Binks, had his charges dropped before the trial date, due to his veteran status. On Monday, after a lively pre-trial anti-drone rally with local media coverage, the courtroom filled with anti-drone activist supporters. The defendants – Martha Hubert, Robin Ryan, Bill Doub and Toby Blomé – all felt strongly that they were not interested in arguing over whether or not they trespassed. In their eyes, they were there to put illegal U.S. drone warfare on trial. They wanted to focus on their intent, which was not to trespass, but to hold their government and military officials accountable for crimes against humanity. They publicly resisted this illegal activity through nonviolent direct action. They wanted to educate Beale AFB personnel about drone warfare and it’s negative effects on the perpetrators as well as the victims. Judge Claire had already denied them their constitutional right to a jury trial, and had denied them the right to use the “Defense of Necessity” argument or to discuss the Nuremberg Principles. In the defendants’ eyes, justice had already failed. The first half of the trial included witnesses from the base giving minute and monotonous details of the legal boundaries of the base property, what signs were posted to sufficiently (or insufficiently) warn visitors, etc. The wonderful pro bono defense attorneys proceeded to find ways to get the charges dismissed based on loopholes, discrepancies, or mismanagement of the arrest. The military video of the arrest included footage of a highway patrol officer actually pushing some of the defendants onto the base property. Called to witness, defendants Robin and Bill did an excellent job speaking for all of the defendants, testifying and emphasizing for the court record our intent to stop wrongdoing, bring accountability and save lives. Ultimately, Judge Claire found all four defendants guilty of trespassing and sentenced them to ten hours of community service. She denied the prosecution’s request for a “deterrent” fine of $300. However, the judge did alert the defendants to expect a harsher sentence next time due to the “Ban & Bar” letter that was served them by the military at the time of their arrest. Of note: A sentencing trial concluded last Friday in NY, for 12 activists who were arrested for an anti-drone protest at Hancock AFB in October of 2012 and recently convicted of disorderly conduct (hooliganism), though acquitted of trespassing. 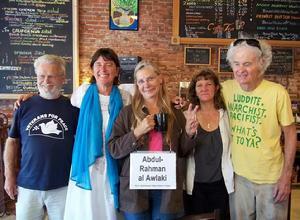 All 12 activists were given the maximum sentence of 15 days in jail and total fines of $375. They were immediately placed under arrest to serve at least 2/3 of their time. In Sacramento, though Judge Claire convicted the Beale AFB protesters of trespassing, she did allow the defendants to give post-sentencing statements. To avoid redundancy, each defendant spoke to different aspects of what motivates them to protest at Beale AFB. Bill spoke about his opposition to drone warfare and his hopes for a peaceful world for his grandchildren. Robin told personal stories of wedding parties attacked, and PTSD suffered by our military. Toby spoke of her personal experience, trying to right these wrongs, many futile visits to congressional offices, and never getting through to our “representatives”. Conventional approaches are ineffective, making it necessary to use “unconventional” tactics. Martha addressed the failings of the justice system. For this case to be about trespassing is a farce. Delivering a letter to the base commander at Beale AFB that day was exactly where these activists should have been as concerned citizens. We pay taxes. This is OUR base and OUR military. It was NOT our intention to trespass. We entered the base to deliver a letter to the base commander. We firmly believe that drone warfare is not in the best interest of our country nor the countries inflicted with this scourge. The military endangers itself by the use of drone warfare, making militants where there were none, making enemies where we should be making friends. What good is it for drones to kill unarmed civilians, so many of whom are children? The so-called “War on Terror” is Terror. We have no right to invade and terrorize other countries in the name of spreading democracy. Their natural resources do not belong to us. Arms manufacturers and other multi-national corporations do not deserve the exorbitant profits awarded to them by proliferating conflicts. We entered the base out of Compassion. We need to invest in life sustaining practices. Our planet is under assault. Healthcare is a mess. Education is underfunded. The disparity between the rich and the poor is accelerating at a rapid pace. Alternative energy is not given anywhere near the funding of the war machine. Our representatives aren’t representing us. We come directly to the military because our previous protests have fallen on deaf ears. We were NOT trespassing. Delivering a letter to the base was exactly where we belonged as concerned citizens. Our government should not ignore the Nuremburg Principles. The United States Government does not have the right to be judge, jury and executioner. Due to the NSA and other draconian governmental organizations, it is very difficult to get adequate information in order to be informed citizens. National Security has been used as an excuse to keep the public in the dark. Fortunately, brave truth tellers have come forward to let us know what’s really happening. Having studied these issues, we feel that it is our responsibility to share pertinent information with the public. We cannot have a democracy without informed citizens. It is important to come to the aid of innocent drone victims and not be silent when we know about the shameful activities of our government done in our name. Justice calls for a fair trial. A fair trial includes a judge and a jury in a court of law. This has been denied to drone victims, be they innocent of any wrong doing or not. Our government is NOT above the law. Money and politics are so entwined that Justice suffers as a result. We entered the base over a matter of life and death; not only the life and death of innocent victims and victims of our economic draft. We’re concerned with the life of what we call democracy in this country. We were NOT trespassing. Honorable Judge Claire, members of the Prosecution, members of the Defense, and those who have chosen to witness this trial today, I am not guilty of this offense. I was arrested at Beale air force base blocking the access road to try to call attention to and stop the armed drones and ‘intelligence’ aircraft the U.S. sends to Afghanistan, Pakistan, and elsewhere to murder our alleged enemies and many innocent bystanders. We should ask if these people are really a threat to us and will murdering or attacking them really decrease the threat to us. Please join me in supporting the individuals who oppose drones and in trying to find other work for those who depend on drone related work to make a living. Our drone war is certain to make our enemies stronger and make it more difficult for us to communicate with them. Instead, I want a world for my 3 grandchildren, their generation and generations to follow that is a peaceful, just world without war and terror. On April 30, 2013 we were delivering an Open Letter to Beale Air Force Base Personnel that summarizes our demands. I will now close by reading that letter. Thank you for your time and compassion. We, the people, charge the US President, Barack Obama and the full military chain of command, to Beale Air Force Base Colonel Phil Stewart, 9th Reconnaissance Wing Commander, every drone crew and service member at Beale Air Force Base, and every other U.S. base involved directly or indirectly with the U.S. drone program, with crimes against humanity, with violations of part of the Supreme Law of the Land, extrajudicial killings, violation of due process, wars of aggression, violation of national sovereignty, and killing of innocent civilians. U.S. military and CIA Drone attacks have killed thousands of innocent civilians, including women and children, in the Middle East, Somalia, Pakistan, and Afghanistan. In the name of combating terrorism against the US, we are terrorizing innocent people and creating many more enemies and potential terrorists in the process. Our government has become a lawless power, acting as judge, jury, and executioner, just because it can. The US uses remote-controlled drones to kill women in their kitchens, elders meeting in their jirgas, mourners at funerals, and rescuers who try to help the wounded. By most independent studies, the vast majority of those killed are civilians. (4) An immediate end to this lawless behavior of drone warfare that violates many international laws and treaties. My Co-defendants, Robin and Bill, have expressed very eloquently the many reasons why we four defendants strongly oppose drone warfare. In my testimony I will explain some of the reasons why, on April 30, 2013, we chose an unconventional approach at Beale AFB to try to stop illegal U.S. drone killings. The 1st Amendment to the Constitution clearly states our right, as U.S. citizens, to petition our government for a redress of grievances. However, our modern society has devolved to the point that conventional methods of petitioning government officials are most often futile, especially when involving issues of foreign policy. The following examples will support this fact. In early 2003, millions and millions of people around the world rallied and marched in the streets to try to stop the pending illegal and unjustified invasion of Iraq; A war based purely on lies, with a cost of over $3 trillion to US taxpayers. An unprecedented unified world voice said emphatically: NO WAR! Our government and the Pentagon were deaf to the world’s cries for peace & reason and 13 years later Iraq remains in ruins with no stable future in sight. In 2006, I joined the “Troops Home Fast” campaign, where citizens from all over the country participated in a hunger fast to protest the Iraq War. Dozens of us traveled to DC to fast publicly in front of the White House. While on a water only fast for 3 weeks, I and Father Louis Vitale, a Franciscan monk, visited nearly every Senator’s office in DC, hand delivering an educational letter about our campaign, talking with staff, and inviting each Senator to talk with us. Not a single senator or staff person responded to our effort. objections to her funding of the Iraq War. Not only did she refuse to meet with us, she continued to support war funding throughout the war, against the will of the vast majority of her S. F. constituents. All of these examples provide concrete evidence that traditional ways to appeal to our elected officials through letters, phone calls, mass marches in the streets, are useless or severely ineffective at best. All four of us could share innumerable personal stories of how our voices are ignored by our government. It appears that “We The People” don’t count. As the horrors of Abu Ghraib and Guantanamo unfolded, we all witnessed absolutely no accountability and no justice for the tortured. Shockingly, the orchestrators of these war crimes are serving as judges in our courts, professors in our universities, and profiting from public presentations and book sales of their memoirs. Reflecting on Guantanamo, a total of 779 men have been detained there. The vast majority were not captured in the heat of battle, but were exchanged for bounty payments, with no evidence of wrongdoing. After months and years of abuse and torture, over 600 have been released without charges, 9 have died. Where is justice? Fast forward to the Obama Administration and drone killing. If our government and the military industrial complex can so easily capture and hold hundreds of innocent human beings for years under horrendous conditions, what errors are being made in our name with targeted U.S. assassination? No country in the world should ever wield such unimaginable power. It is illegal! Many of the so called “militants” that we have eliminated with drone missiles were, as in Guantanamo, also identified by informants who received bounty payments. Is wrongful execution by hellfire missile preferable to wrongful indefinite detention? With a government that is practicing such unrestrained abuses without any oversight by other branches of the government, is that a government that would listen to the voices of justice in conventional ways that have previously failed? Four U.S. citizens have now been executed by drone missiles, in violation of our constitution. One, Abdulrahman Al-Alawki, was a 16 year old boy born in Denver Colorado. 5 other boys were killed by the same drone attack that killed Abdulrahman that day in Yemen. President Obama refuses to release any legal memos or make meaningful public discourse to explain the justification for these killings. Last February I participated in a protest at the Senate confirmation hearing of John Brennan to head the CIA. For years John Brennan has been the architect of the secret CIA drone program. The morning of the hearing I learned that the CIA and the Obama Administration do not even notify the Intelligence Committee of our Senate which countries they are using drones for targeted killing. Where are the checks and balances if Congress doesn’t even know where the killing is taking place? What happened to the rule of law? At Brennan’s confirmation hearing, our very own Senator Feinstein, chair of the Intelligence Committee, told the American public about in her opening statement that there have been only single digit civilian deaths per year from drone attacks. All independent research indicates many more than that, and nearly 200 children in Pakistan alone have been killed. When 4 of us visited Senator Feinstein’s office the next morning to deliver a list of the names of nearly 200 children that have been killed by drones, her own aide confessed that they already know there have been more than single digit civilian deaths per year. He refused to clarify. However, while caught off his guard, he unconsciously admitted to the willful dishonesty by his boss, a California Senator. President Obama and John Brennan have also repeatedly lied to the public about the drone program. Is a government without integrity expected to be concerned about the wishes of its people? very illegal and controversial subject. Another government official unwilling to uphold the U.S. Constitution. Where should a citizen turn? What choices are left? What effective means do we have to change the disastrous and unprecedented course we are taking with drone warfare? The unlimited powers that are being unleashed are unfathomable. From the examples that I have given, do you think that we can have any hope that petitions, or letters or phone calls will make an ounce of difference? Especially when so much of the truth is being hidden from the vast majority of Americans? How do we change course, and how do we hold our elected officials accountable when so much of the public is in the dark. A country who fails to remember it’s past is doomed to repeat it. This book, “Kill Anything that Moves,” is the result of 10 years of thorough research by Nick Turse, gleaned from military documents and interviews with Vietnam War veterans and civilian survivors in Vietnam. It is a very painful book to read, and every page is filled with the disheartening details of how it was the Pentagon’s strategy to systematically slaughter the South Vietnamese people through aerial bombardment, the burning of thousands of small villages, starvation via destruction of their rice crops, and more. The atrocities are endless. I ask Your Honor: Where were the checks and balances in our government 50 years ago? How did such systematic atrocities continue to be committed throughout the 10 year course of that war, without effective objections by our Congress? What has changed since then? As Robin pointed out, our soldiers are serious victims of these horrendous foreign policies forced upon them. One day in the future there will be a courageous graduate student who will put 10 years of research into documenting the atrocities of the Afghanistan, Iraq and U.S. secret drone wars. What country is next? informal complaints by citizens who have lost loved ones to U.S. drone strikes. Our foreign embassies have sadly become nothing more than huge expensive fortresses to house CIA and Special Forces to protect them in their dirty war games. With these examples, Your Honor, I hope I have successfully explained why conventional ways cannot and will not work in influencing our government to change its disastrous course. We defendants and other activists who come to Beale AFB every month, envision a different America. A world where we embrace the children and people of Pakistan and Yemen and Somalia as our brothers and sisters that we share a common humanity with. Every human being has a right to life, liberty and the pursuit of happiness and no life is worth sacrificing to protect corporate profits at home or abroad. We were not trespassing at Beale AFB. We were acting in one of the few ways that we have left to make a difference. We came with the intent to hold our military and political leaders accountable to crimes against humanity when our representatives in Congress have failed to do so. And equally important, we came to educate the military personnel at Beale AFB about the wrongfulness of U.S. policies, to remind them of their responsibility to protect the innocent and to encourage them to come over to the side of peace. I engaged in protest and civil disobedience on the road to Beale, out of a rational, persistent and heartfelt need to raise awareness of the illegal and immoral nature of U.S. drone warfare, to educate others about the ill effects of our covert war policies, to make public the names and images of innocent children we can name who have died by U.S. drone strikes, and to call attention to the fact that the UAV surveillance tactics engaged in by the military personnel at Beale do play a critical part in the eventual deaths, dismemberment and terrorizing of fellow human beings. We aren’t legally at war with these countries. Why are we there? Drone strikes hurt the American people. American military personnel are forced to carry out the orders of their Commander-in-Chief and their superior officers, placing them in moral dilemmas and compromising their ethics. Refusing orders can result in a dishonorable discharge — while whistleblowing about the indiscriminate killing from drone strikes may very well result in a prison sentence, as it has in the case of Private Chelsea Manning. PTSD and suicide is endemic among current military personnel and veterans alike, including those who make the UAV programs run. The military does its best to downplay this problem and the conditions that create it. Drone pilots are among those who suicide. Anwar al-Awlaki and his 16-year-old son Abdulrahman, two American citizens assassinated by drones while living abroad, are testament to the harmful and illegal nature of our drone policy. Our U.S. drone program is counterproductive. It fosters hate and escalates terrorism around the world. Drone strikes hurt people abroad. They can and they do kill indiscriminately. All men of military age can be defined as militants, and may be under suspicion. Individuals, families, communities and entire villages in Afghanistan, Pakistan, Iraq, Yemen and Somalia are under constant surveillance by drones such as the Global Hawk, flown out of Beale AFB. In addition to killing innocent civilians, U.S. hellfire missiles, dropped in secondary strikes, have killed those who have come out to provide emergency medical assistance to injured and dead parties. Last October, a 13 yr. old Pakistani boy named Zabair testified before Congress that he and his younger sister were injured in a drone strike the previous October in Waziristan, and that his 67-year-old grandmother, who was a village midwife and not a militant, was killed by a CIA drone while picking okra. This family’s testimony marked the first time that Congress had ever heard from civilian victims of an alleged U.S. drone strike. A recent drone strike in Yemen claimed the lives of 13 civilians who were attending a wedding ceremony. The ceremony was mistaken for an Al Queda gathering, proving that the image quality of drone surveillance equipment is very low and not fit for combat. The Bureau of Investigative Journalism has stated that since 2004, Pakistan alone has been hit by 381 drone strikes, and between 416-951 civilians have been killed. Other independent reports name nearly 200 children killed in Pakistan and Yemen – lovely, worthy children. When I call our American legal system to mind, I would rather think of the ways in which it sets precedents for truth, justice, and civil rights protections than be reminded of the non- transparent ways it fails to prosecute those who commit real and ongoing war crimes. When I call myself to mind, I would rather be truthful and outspoken against wrongdoings and unlawful actions that abuse or destroy life, than I would submit to a silent complicity of these wrongdoings. As a conscious individual acting in good conscience, my intention was not to trespass, but to deliver a message to the public, the Beale base commander and its personnel. Judge Claire, I am not guilty. We, the defendants, are not guilty.